A demo version is available for Windows and OS X. 640x360, 1280x720, or 1920x1080. Fullscreen mode blurs the visuals. Game speed is designed only for 60 FPS. See Frame rate capping. ↑ 1.0 1.1 File/folder structure within this directory reflects the path(s) listed for Windows and/or Steam game data (use Wine regedit to access Windows registry paths). Games with Steam Cloud support may store data in ~/.steam/steam/userdata/<user-id>/595500/ in addition to or instead of this directory. The app ID (595500) may differ in some cases. Treat backslashes as forward slashes. See the glossary page for details. "The developer has also been active on Twitter following the announcement, sharing what seems to be an initial screen to showcase the game's development in Unity." 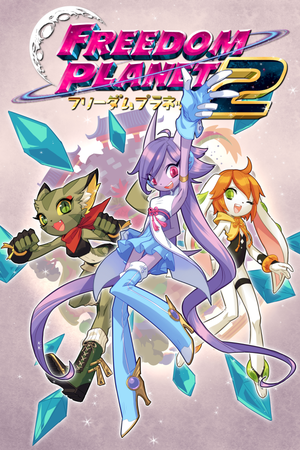 "Freedom Planet 2 will follow a similar platform release as FP1: PC/Mac/Linux first followed by Nintendo, plus more depending on resources." "If you have a monitor with a refresh rate bigger than 60hz, try lowering it to 60hz or enabling Vertical Sync for your graphics card."